The solar trees have the capacity to generate 182 kWp and are installed in such a way that they are capable of meeting the energy demand of the entire memorial. 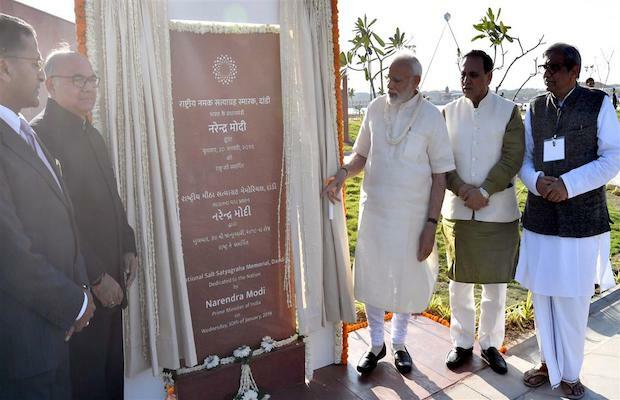 Prime Minister Narendra Modi recently inaugurated the prestigious National Salt Memorial on the 150th death anniversary of Mahatma Gandhi. The memorial, built in honour of the famous Dandi March by Mahatma Gandhi, houses 41 solar trees on campus. With a unique combination of history and innovative technology going hand in hand, the memorial houses various artifacts and souvenirs of the famous freedom fighter along with 41 solar trees. Waaree Energies, one of the country’s leading solar PV manufacturer was the partner in supplying solar panels for these trees. With a highly efficient 370 Wp monocrystalline panels, the solar trees have the capacity to generate 182 kWp and are installed in such a way that they are capable of meeting the energy demand of the entire memorial thus making it a net zero energy building. Recently, the company installed its modules at Amul’s warehouse facility located in Gandhinagar. According to the company sources, the commissioned plant has been developed for captive consumption, and Waaree Energies serves as a turnkey Engineering Procurement and Construction (EPC) partner to the brand. Further, the rooftop solar installations are spread across the roof of Amul and it will provide power to run automated warehousing machines at its warehouse. Waaree also unveiled its 25 kW rooftop solar project at Himalayan Institute of Alternatives (HIAL) in Leh, Ladakh. HIAL is expected to save close to Rs 2 lakh per year. The installation of this project is of critical importance as solar power brings much-needed respite to the people of Ladakh since the region is cut off from the Kashmir valley for most of the winter.